Monochromatic Nursery: Go or No? These will totally transform the way you think about black and white nurseries. › Monochromatic Nursery: Go or No? These will totally transform the way you think about black and white nurseries. Monochromatic Nursery: Go or No? These will totally transform the way you think about black and white nurseries. Black & white may seem controversial, but with the right picks and placement of decor, furniture and paint you’re bound to have a classic room that can cascade to your growing child’s years. Welcoming your baby into this world can already be an exhausting task, much more that you have to prepare a room to suit you and your baby’s needs. Nurseries often need months (or years) of preparation, but even the time-constrained parent can still pull off a wonderful nursery with our helpful tips. Is Black & White For Me? The first thing you have to consider is if this palette is suitable for you and your kid. Remember, well-designed rooms can last for up to 5 years until a redecoration or renovation. You have to consider your budget & style preferences, and other factors. What are my room requirements? Who will be frequenting this room? How much budget do I have for this project? Am I open to renovation in the future? Will the interior elements such as furniture & decor be reusable for this space or other spaces in case no longer needed? What style will be best? Financially speaking, if you are looking to keep the room for years, this style is for you. Budget-savvy moms will appreciate this style because it won’t take much time and space. It’s a quick pick for a nursery that will transition to a young adult’s room or be converted to a guest room. If minimalism is what you dig, this palette works best if you have less-cluttered homes. Black and white is very versatile, so any house can dress this well. What Design Elements Should I Put In? 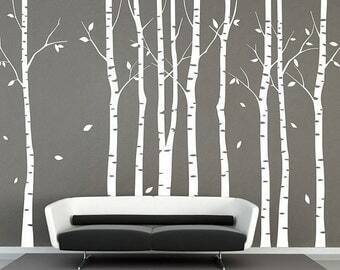 If you’re going for a white wall, wall decal stickers are a fantastic way to liven up the room. You can buy colourful animal decals or beautiful quotes that can inspire you or your child’s caretaker and they’re very easy to apply. All you have to do is have a sponge or dirt cloth to remove dirt from the wall, apply the decal and use any wide flat tool for a level to make the application. If you’re opting for a dark wall (a black or matte charcoal), check if the paint is baby-safe. Most baby paints should be VOC-free, lead-free and non-toxic. The paint must also be the same standard for the floor and crib. To make it stand out, you can use accents to make it stand out such as gold, silver or copper for an elegant look. Carpets and rubber mats are nursery’s best friends but the maintenance can be daunting especially to newborn moms. Stick to something that is durable, quiet and allows easy mopping or sweeping such as vinyl tiles or laminated wood. Dark mahogany boards or any dark floorboard can make a bold statement. Ask your local home depot for other options and make sure you note that it is for a nursery. ADD SOME COLOUR TO YOUR INBOX & CLICK HERE TO SIGN UP FOR OUR NEWSLETTER AND GET MORE NURSERY TIPS, TRENDS & INSPIRATION PLUS UP TO 70% OFF OUR SALES!